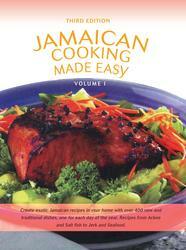 'Jamaican Cookbook With The Reggae Diet Commemorates Black History Month And Bob Marley Day'. The largest Jamaican Cookbook ever published with four hundred authentic Jamaican recipes is officially launched by GetJamaica.Com to commemorate Black History Month and Bob Marley Day. The first of its kind to promote the now famous 'Reggae Diet'. Now cooks and chefs across the world can find the real reggae taste of Jamaica in almost every dish they prepare thanks to GetJamaica.Com and their new publication Jamaican Cooking Made Easy Volume I. Described as a food and entertaining enthusiasts dream, the Jamaican Cookbook boasts over four hundred (400) authentic traditional and new dishes that are delighting food preparation specialists. The book was compiled using recipes from the simple man on the street to the executive chefs in five star hotels in Jamaica resulting in the true reggae diet taste. To celebrate the launch of the cookbook GetJamaica.Com has partnered with the several local and overseas institutions to promote Jamaican Cuisine to commemorate both Black History Month and Bob Marley Day. "Jamaican cuisine is one of the most distinctive aspects of the countries culture and our company is enthused to use our publication to honor such a great Jamaican as Bob Marley and such an important period as Black history month" said Colin Scott VP of GetJamaica.Com. The book is really a user generated cookbook, and that's evidenced by some of the great tasting Jamaican Recipes that most people know about, such as Ackee and Cod fish, Jerk Chicken and Rum Cakes, along with delightfully new palates such as Mango Flavored Shrimp, Jerk Buffalo Wings and the now the famous Jerk Thanksgiving Turkey. "I'm excited that GetJamaica.Com has been able to engage the food lovers community to capture the true cooking spirit of the island by mixing already popular with new and innovative recipes in a culinary masterpiece,". Scott said. "The three year project of compiling, documenting and archiving over 1,000 Jamaican cooking recipes was a wonderful success". Available in paperback the Jamaican Cooking book is distributed in over 4,000 popular book store locations across the USA and is available on Amazon.Com, Barnes and Noble.Com, Google Books and Yahoo Books. Jamaican Cooking Made Easy is also distributed electronically via interactive portable document format (pdf) with a click to search and find feature and is available on the website. GetJamaica.Com is the fastest growing online resource for information on Jamaica with over 3 million visitors annually who share, search, ask questions, and download recipes, articles and photos about the island. Founded in May 2006 the site has seen month over month growth in visitors and is changing the face Jamaica's online presence and visibility. Establishing a network of over 250 websites with adaptable web 2.0 technologies the brand is pioneering internet marketing and promotion in the island.